ALBUQUERQUE, N. M., February 20, 2019 – BNSF Railway Company (BNSF) today announced that its 2019 capital expenditure program in New Mexico will be approximately $80 million. Maintenance projects to ensure BNSF continues to operate a safe and reliable rail network account for a majority of this year’s plan in New Mexico. Those projects consist of replacing and upgrading the main components for the tracks on which BNSF trains operate including rail, rail ties and ballast. Nearly 4.5 million carloads of freight move along BNSF lines in New Mexico annually. 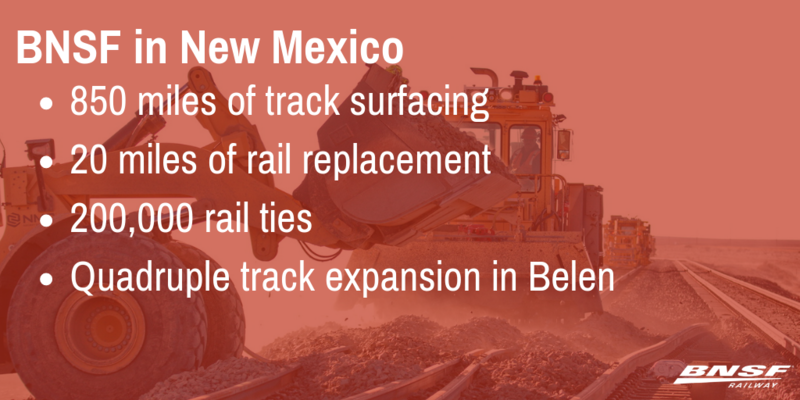 The 2019 maintenance program in New Mexico includes more than 850 miles of track surfacing and/or undercutting work as well as the replacement of approximately 20 miles of rail and more than 200,000 ties. BNSF has invested approximately $555 million to expand and maintain its network in the state over the past five years. On the Clovis Subdivision in Belen, BNSF will begin a project to extend its quadruple main tracks to enhance capacity along the Southern Transcon route. “The Southern Transcon is the primary route for BNSF’s intermodal franchise. Building upon our investments totaling more than $1 billion in 2018 on the route, the extension of the quadruple track in Belen highlights our commitment to provide a safe, efficient and reliable network to our customers,” said Keary Walls, general manager of operations, Southwest Division.